Figure 1. ORIGINAL CAPTION: “Fig. 7 Average biases (model—observations) in downward solar radiation at Earth’s surface calculated in 43 CMIP5 models at 760 sites from GEBA. Units Wm−2”. The “CMIP5” is the “Computer Model Intercomparison Project 5”, the fifth iteration of a project which compares the various models and how well they perform. The bottom line is that when it comes to a CO2 effect on global climate, no one knows what they’re talking about. In my recent essays on Tide Gauges, the question of the durability of original measurement uncertainty raised its toothy head in the comments section. Are Claimed Global Record-Temperatures Valid? The New York Times claims 2016 was the hottest year on record. Click for article. The illustration implies that repeatability, or decreased variance, is a part of precision. It is, but more importantly, it is the ability to record, with greater certainty, where a measurement is located on the continuum of a measurement scale. 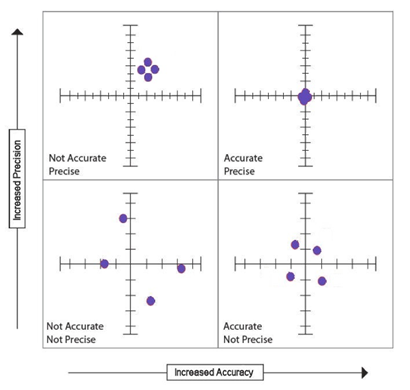 Low accuracy is commonly the result of systematic errors; however, very low precision, which can result from random errors or inappropriate instrumentation, can contribute to individual measurements having low accuracy. For the sake of the following discussion, I’ll ignore issues with weather station siting problems potentially corrupting representative temperatures and introducing bias. However, see this link for a review of problems. Similarly, I’ll ignore the issue of sampling protocol, which has been a major criticism of historical ocean pH measurements, but is no less of a problem for temperature measurements. Fundamentally, temperatures are spatially-biased to over-represent industrialized, urban areas in the mid-latitudes, yet claims are made for the entire globe. In general, modern temperature-measuring devices are required to be able to provide a temperature accurate to about ±1.0° F (0.56° C) at its reference temperature, and not be in error by more than ±2.0° F (1.1° C) over their operational range. Table 4.2 requires that the resolution (precision) be 0.1° F (0.06° C) with an accuracy of 0.4° F (0.2° C). The US has one of the best weather monitoring programs in the world. However, the accuracy and precision should be viewed in the context of how global averages and historical temperatures are calculated from records, particularly those with less accuracy and precision. It is extremely difficult to assess the accuracy of historical temperature records; the original instruments are rarely available to check for calibration. The second issue is the precision with which temperatures are recorded, and the resulting number of significant figures retained when calculations are performed, such as when deriving averages and anomalies. This is the most important part of this critique. If a temperature is recorded to the nearest tenth (0.1) of a degree, the convention is that it has been rounded or estimated. That is, a temperature reported as 98.6° F could have been as low as 98.55 or as high as 98.64° F.
Unlike a case with exact integers, a reduction in the number of significant figures in even one of the measurements in a series increases uncertainty in an average. Intuitively, one should anticipate that degrading the precision of one or more measurements in a set should degrade the precision of the result of mathematical operations. As an example, assume that one wants the arithmetic mean of the numbers 50., 40.0, and 30.0, where the trailing zeros are the last significant figure. The sum of the three numbers is 120., with three significant figures. Dividing by the integer 3 (exact) yields 40.0, with an uncertainty in the next position of ±0.05 implied. Now, what if we take into account the implicit uncertainty of all the measurements? For example, consider that, in the previously examined set, all the measurements have an implied uncertainty. The sum of 50. ±0.5 + 40.0 ±0.05 + 30.0 ±0.05 becomes 120. ±0.6. While not highly probable, it is possible that all of the errors could have the same sign. That means, the average could be as small as 39.80 (119.4/3), or as large as 40.20 (120.6/3). That is, 40.00 ±0.20; this number should be rounded down to 40.0 ±0.2. Comparing these results, with what was obtained previously, it can be seen that there is an increase in the uncertainty. The potential difference between the bounds of the mean value may increase as more data are averaged. While multiple observers may eliminate systematic error resulting from observer bias, the other requirements are less forgiving. Different instruments will have different accuracies and may introduce greater imprecision in averaged values. Similarly, measuring different angles tells one nothing about the accuracy or precision of a particular angle of interest. Thus, measuring multiple temperatures, over a series of hours or days, tells one nothing about the uncertainty in temperature, at a given location, at a particular time, and can do nothing to eliminate rounding errors. A physical object has intrinsic properties such as density or specific heat. However, temperatures are ephemeral and one cannot return and measure the temperature again at some later time. Fundamentally, one only has one chance to determine the precise temperature at a site, at a particular time. This automated procedure is performed with temperature sensors specified to have an RMS error of 0.9° F (0.5° C), a maximum error of ±1.8° F (±1.0° C), and a resolution of 0.1° F (0.06° C) in the most likely temperature ranges encountered in the continental USA. [See Table 1 in the User’s Guide.] One (1. ±0.5) degree Fahrenheit is equivalent to 0.6 ±0.3 degrees Celsius. Reporting the rounded Celsius temperature, as specified above in the quote, implies a precision of 0.1° C when only 0.6 ±0.3° C is justified, thus implying a precision 3 to 9-times greater than what it is. In any event, even using modern temperature data that are commonly available, reporting temperature anomalies with two or more significant figures to the right of the decimal point is not warranted! Where these issues become particularly important is when temperature data from different sources, which use different instrumentation with varying accuracy and precision, are used to consolidate or aggregate all available global temperatures. Also, it becomes an issue in comparing historical data with modern data, and particularly in computing anomalies. A significant problem with historical data is that, typically, temperatures were only measured to the nearest degree (As with modern ASOS temperatures!). Hence, the historical data have low precision (and unknown accuracy), and the rule given above for subtraction comes into play when calculating what are called temperature anomalies. That is, data are averaged to determine a so-called temperature baseline, typically for a 30-year period. That baseline is subtracted from modern data to define an anomaly. A way around the subtraction issue is to calculate the best historical average available, and then define it as having as many significant figures as modern data. Then, there is no requirement to truncate or round modern data. One can then legitimately say what the modern anomalies are with respect to the defined baseline, although it will not be obvious if the difference is statistically significant. Unfortunately, one is just deluding themselves if they think that they can say anything about how modern temperature readings compare to historical temperatures when the variations are to the right of the decimal point! Indicative of the problem is that data published by NASA show the same implied precision (±0.005° C) for the late-1800s as for modern anomaly data. The character of the data table, with entries of 1 to 3 digits with no decimal points, suggests that attention to significant figures received little consideration. Even more egregious is the representation of precision of ±0.0005° C for anomalies in a Wikipedia article wherein NASA is attributed as the source. Ideally, one should have a continuous record of temperatures throughout a 24-hour period and integrate the area under the temperature/time graph to obtain a true, average daily temperature. However, one rarely has that kind of temperature record, especially for older data. Thus, we have to do the best we can with the data that we have, which is often a diurnal range. Taking a daily high and low temperature, and averaging them separately, gives one insight on how station temperatures change over time. Evidence indicates that the high and low temperatures are not changing in parallel over the last 100 years; until recently, the low temperatures were increasing faster than the highs. That means, even for long-term, well-maintained weather stations, we don’t have a true average of temperatures over time. At best, we have an average of the daily high and low temperatures. Averaging them creates an artifact that loses information. When one computes an average for purposes of scientific analysis, conventionally, it is presented with a standard deviation, a measure of variability of the individual samples of the average. I have not seen any published standard deviations associated with annual global-temperature averages. However, utilizing Tchebysheff’s Theorem and the Empirical Rule (Mendenhall, 1975), we can come up with a conservative estimate of the standard deviation for global averages. That is, the range in global temperatures should be approximately four times the standard deviation (Range ≈ ±4s). For Summer desert temperatures reaching about 130° F and Winter Antarctic temperatures reaching -120° F, that gives Earth an annual range in temperature of at least 250° F; thus, an estimated standard deviation of about 31° F! Because deserts and the polar regions are so poorly monitored, it is likely that the range (and thus the standard deviation) is larger than my assumptions. One should intuitively suspect that since few of the global measurements are close to the average, the standard deviation for the average is high! Yet, global annual anomalies are commonly reported with significant figures to the right of the decimal point. Averaging the annual high temperatures separately from the annual lows would considerably reduce the estimated standard deviation, but it still would not justify the precision that is reported commonly. This estimated standard deviation is probably telling us more about the frequency distribution of temperatures than the precision with which the mean is known. It says that probably a little more than 2/3rds of the recorded surface temperatures are between -26. and +36.° F. Because the median of this range is 5.0° F, and the generally accepted mean global temperature is about 59° F, it suggests that there is a long tail on the distribution, biasing the estimate of the median to a lower temperature. In summary, there are numerous data handling practices, which climatologists generally ignore, that seriously compromise the veracity of the claims of record average-temperatures, and are reflective of poor science. The statistical significance of temperature differences with 3 or even 2 significant figures to the right of the decimal point is highly questionable. One is not justified in using the approach of calculating the Standard Error of the Mean to improve precision, by removing random errors, because there is no fixed, single value that random errors cluster about. The global average is a hypothetical construct that doesn’t exist in Nature. Instead, temperatures are changing, creating variable, systematic-like errors. Real scientists are concerned about the magnitude and origin of the inevitable errors in their measurements.